Sometimes, a film can do everything right, yet not quite move me in the way that (I’m assuming) it meant to. I’m not necessarily thinking about tragic romances or tear-jerkers when I say this, since those types of film tend to be manipulative by their very nature (a manipulation which I’ve managed to avoid for most of my life with the exception of animal stories, which tend to reduce me to a blubbering man-baby in no-time flat). Rather, I’m thinking about certain particularly earnest dramas, dramatic films which tend to have important ideas and themes yet are diluted to the point of banality due to their pressing need to appeal to as wide an audience as possible. These are not bad films, necessarily, but they are safe films and tend to have as much real resonance and staying power as similarly sincere “made-for-TV” films: the “After-School Special” syndrome, as it were. Although Lee Daniels’ historical drama The Butler is extremely well-made and filled with some very solid performances, the film has an unfortunate tendency to carve out a middle-of-the-road path that makes it feel technically adept, yet unfortunately disposable. In a year where Steve McQueen released the painful open-wound that was 12 Years a Slave, Daniels’ The Butler doesn’t seem quite as weighty. Loosely-based on the life of Eugene Allen, who served as White House butler over the course of 34 years and eight different presidential administrations, The Butler features Forrest Whitaker as the fictionalized Cecil Gaines. Together with his wife, Gloria (Oprah Winfrey) and sons Louis (David Oyelowo) and Charlie (Elijah Kelley), Cecil watches the U.S. go through many social changes and struggles, from the Civil Rights movement to the Vietnam War, from the rise of the Black Panthers to the assassination of JFK. Through it all, Cecil tries to hold on to the same quiet sense of dignity that he’s maintained since he first watched his father get murdered on a sharecropper’s farm, even as his eldest son, Louis, becomes more and more involved in “radical” politics. Father and son eventually wind up at odds with each other, as one continues to throw himself into a life of service, while the other comes to realize the importance of fighting for your own human rights. One of the biggest problems with The Butler, as strange as it may seem, is that the film is really too short to fully develop all of its ideas and themes. Even though Daniels’ film clocks in at a little over two hours, it has an awful lot of history and time to wade through: 34+ years, to be exact. As such, much of the film takes on the feel of a “Cliff-Notes” version of the events. I’m not asking that we spend an inordinate amount of time on any particular era: I fully understand that this was not meant to be an exhaustive history of the United States, only a fictionalized account of one man’s life. Nonetheless, the film has a tendency to speed through decades (and eras) that can give short-shrift to not only characters and story elements but to actual themes, as well. This problem becomes exacerbated by the numerous sub-plots that begin to crop up everywhere: Gloria’s affair with Howard (Terrence Howard); Charlie’s military service; Louis’ increasing radicalization. In and of themselves, any of these subplots would be enough to give added meat to the core story of Cecil and the White House. Taken altogether, however, the effect becomes not only rather overwhelming but of decidedly questionable intent: what, exactly, is the point of Gloria’s affair with Howard? Other than an offhand mention once or twice, the situation seems to have no bearing on the story whatsoever. It felt like a rather misguided attempt to add depth to Winfrey’s character, as well as providing more of a role for Howard. In reality, however, it just ends up bloating the story unnecessarily and led me to focus more energy/attention on Howard’s character than was needed. It almost seemed as if the subplot existed simply to pad out Terrence Howard’s role. I only mention this notion of “padding” since there are an awful lot of characters moving in, out and around the perimeter of the story and many of them seem to exist only to offer a little screen-time to some very familiar faces. We get the various presidents that Gaines works for, of course, played by a virtual cornucopia of actors: Robin Williams as Eisenhower; James Marsden as Kennedy; Liev Schreiber as LBJ; John Cusack as Richard Nixon and Alan Rickman as Ronald Reagan. Of these, only Schreiber, Cusack and Rickman get much time, with Williams putting in more of a glorified cameo and Marsden not making much impression as Kennedy at all. Schreiber is quite magnificent as Johnson, bringing a real sense of grit and a bit of a lunatic edge to the 36th President: the bit where he barks orders while seated on the toilet is both inspired and a little scary. Cusack is admirably sleazy as Nixon and inhabits the role quite nicely: I’ve really come to appreciate his acting over the last several years, even if his taste in roles (The Butler notwithstanding) has been a bit questionable of late. Rickman’s portrayal of Reagan is a bit odd, to be honest: at first, I thought this was Ciaran Hinds reprising his role from Political Animals. It was only during the credits that I realized I’d been watching Alan Rickman all along. Recognizable or not, Rickman’s performance also reminded me the least of the various represented presidents, with Marsden’s generic JFK coming in a close second. Along with these famous presidential portrayers, we also get Mariah Carey as Cecil’s young mother; Terrence Howard as Cecil’s friend/Gloria’s lover; Vanessa Redgrave as the aged matriarch of a plantation; Clarence Williams III (aka Linc from the Mod Squad) as Cecil’s mentor; Cuba Gooding, Jr. as Carter, a White House butler who becomes like a brother to Cecil; Lenny Kravitz as another White House Butler; Minka Kelly as Jackie Kennedy and Jane Fonda as Nancy Reagan. Many of these performances, such as Carey and Redgrave, amount to little more than brief cameos, sometimes giving the proceedings the feel of one of those epic, star-studded Herman Wouk mini-series’ from a bygone era of television. Despite the occasional celebrity overkill, there are plenty of good performances filling The Butler. Whitaker is a consistently gentle and dignified presence, the very definition of perseverance. Oprah isn’t amazing in her role as Gloria but she gets steadily better as the film progresses and she has some genuinely powerful moments in the film’s back half. Cuba Gooding Jr. is charmingly rakish as Carter, managing to make the character both filthy and boyishly innocent: it’s the kind of role that makes me wish Cuba did these kind of roles more often. Kelly and Fonda give two very different types of performances but both actresses manage to nail their respective First Ladies to a tee. The very idea of Jane Fonda playing the uber-conservative Reagan is good for a laugh but Fonda really sinks her teeth into the role, portraying Nancy as quick, smart and strangely fashionable, in her own way. Kelly, by contrast, gets a stunning scene where she sits wailing in the Oval Office, covered in her dead husband’s blood. It would be a powerful scene in any film but becomes particularly resonant when paralleled with the Gaines’ own loss later on. From a film-making perspective, The Butler has a nice, gritty look, partly thanks to cinematographer Andrew Dunn (who also shot Daniels’ Precious). This results in some nice period pieces, a look which is deflated a bit by the film’s over-reliance on its obvious and, to be honest, schmaltzy score. The script is good, too, although it featured far too many disparate threads and subplots for my liking. I was also a bit curious as to why Daniels’ chose to gloss over Gerald Ford and Jimmy Carter almost completely: whereas Presidents 34-37 and 40 get their own scenes and representations, Presidents 38-39 are only seen via stock footage. I’m pretty sure that this is due to the film’s tendency to try and cram too much info into too small a space but I’m only guessing. Regardless of the reason, I thought it a little odd and certainly part of “Cliff-Notes” issue I had with the film, as a whole. 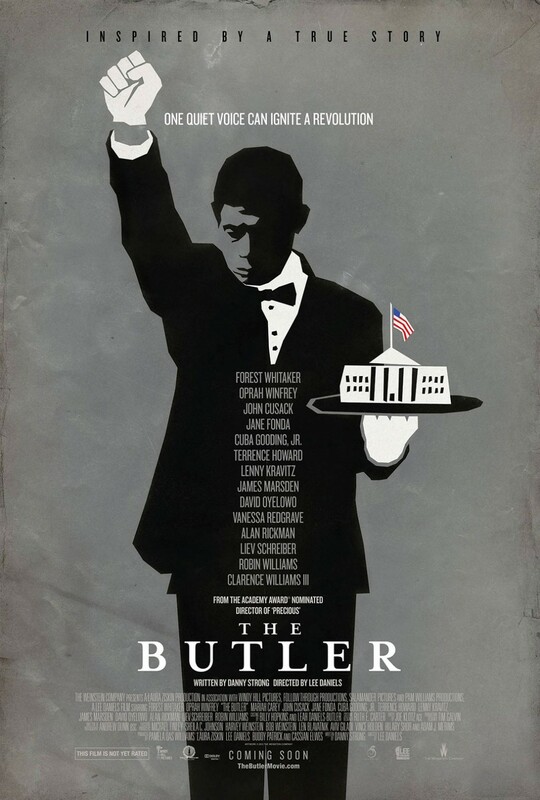 In truth, I liked The Butler enough to want more but found myself consistently frustrated by the film’s tendency to skim the surface of so many issues. I was also nagged by the feeling that the film seemed to lose its interest in Cecil halfway through, choosing to switch the focus to Louis. In some ways, I think this has to do with the vast difference in their philosophies: Louis’ immersion in the Civil Rights Movement makes for a much more kinetic film experience than Cecil’s stoic acceptance of his circumstances. This still has the effect of making Cecil the second-banana in his own story, however, which seems like just one more slight to heap on the guy. Ultimately, The Butler stands as a good film that strives to be much more: it strives to be an enduring classic. While there’s much to laud here, the film just doesn’t do much new with its subject matter, even if it does do it well. In a year that was filmed with absolute masterpieces, The Butler stands proudly but doesn’t stand out quite as much as it might have hoped. Ironically enough, this seems to be strangely fitting for a film about a man who proudly (and quietly) went about his job for 34 years.